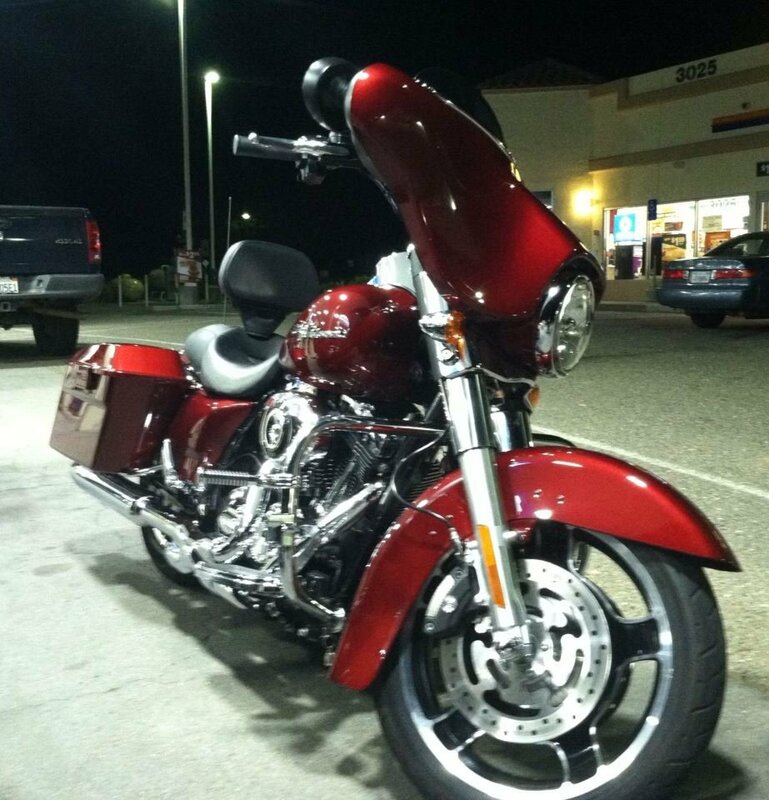 Almost four weeks ago I was in an accident which totaled my 2010 Street Glide, “Scarlet”. Kind of silly naming a motorcycle but it’s all in fun. I was quite upset with the insurance company for totaling her, but seems it will work out for the better. A friend of mine saw the post about the accident and Scarlet on Facebook and offered to sell me her bike. 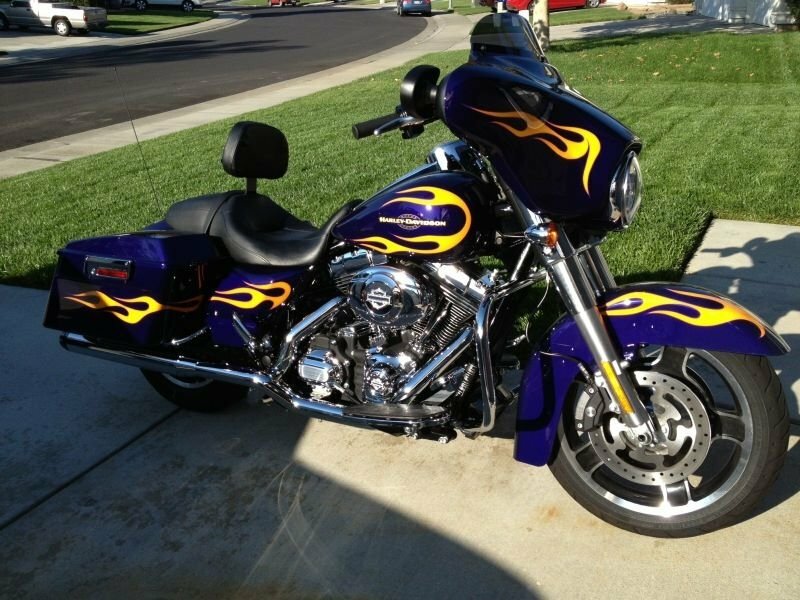 This is the bike of my dreams, it’s a 2012 Street Glide, custom paint, Purple with flames. When I bought my first Harley, I almost bought this exact bike. While I was at Harley Davidson looking at the Purple with flames Street Glide, I went to sit on it and who ever sat on it before didn’t put the jiffy stand down all the way. When I went to straddle it it started to tip over. Mind you, there was a very long row of brand new Street Glides. I panicked, I could just see all those beautiful bikes going down like a row of dominos. I wrenched my stomach muscle keeping it from falling over. At the time I thought the Street Glide was too big for me. After going back and forth several times, I went back to purchase it, but it was gone. I settled on a gorgeous Road King Classic I found, but for months I kicked myself for settling. I allowed myself to be swayed by the incident and an article I read about “Women buying bikes too big for them, to be aware”. My husband pointed out the obvious, if I was able to save the bike from falling over in mid fall, then the bike wasn’t too big. 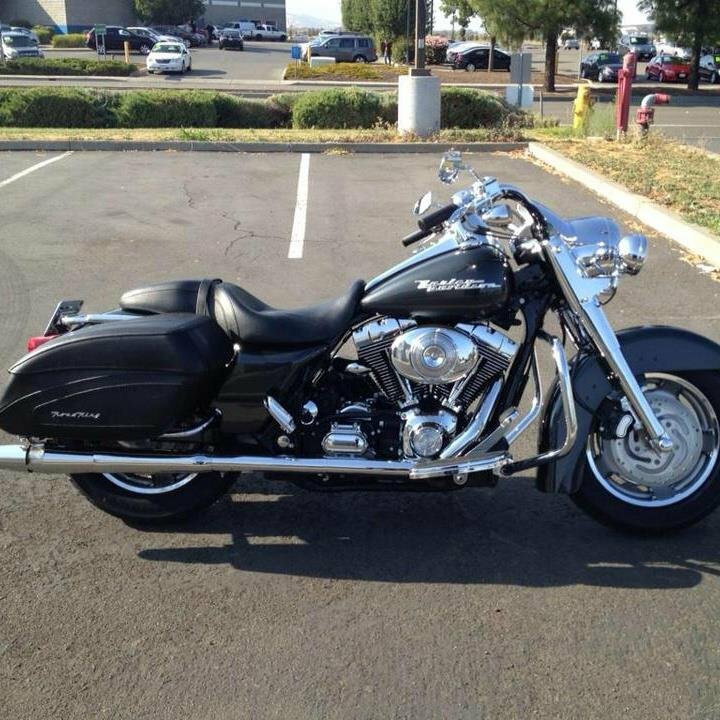 I found Scarlet a few months later and traded the Road King in for her. I was happy as a clam, she was a great bike. She handled incredibly well for a big bike, actually for any size bike. My friends bike is “Scarlet”, but even better. Better brakes, better engine, less miles, better exhaust with Tru Duels from Rinehart and best of all, more bling. The only thing I’m having trouble with is the name. I know, I know, it’s kind of silly but it’s fun. My husband came up with “Purple Hooter”, I like it but it’s a little long. I was thinking more of a single word name, like “Violet”. The thing is, it’s, I don’t know, it’s, kind of a sissy name for such a bad ads bike. What do you think? Violet? Or Purple Hooter? Violet. Goes with the color theme of names… Scarlet, Violet, … and so on.